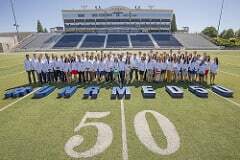 Since 1969, the University of Nevada, Reno School of Medicine has prepared more than 3,100 students, residents and fellows to lead the way to better health. The School of Medicine prides itself on providing patient care and clinical training throughout northern Nevada. The support of our community – local physicians inviting students into their practices, patients allowing learners to observe, donors providing much needed scholarship funding has been instrumental in the training of our students over the past 50 years. The School of Medicine 50th Anniversary Scholarship Endowment is being established to help ensure we are able to prepare our future physicians for generations to come.